Glenn noticed that his neighbor was saving BIG on his electric bill each month after going solar. After some research, Glenn found that Carolina Energy Conservation carried the best panels on the market and that was just what he wanted. He gave us a call and had a 6.3kW system installed on his home! Now Glenn is enjoying all the savings that come with going solar! 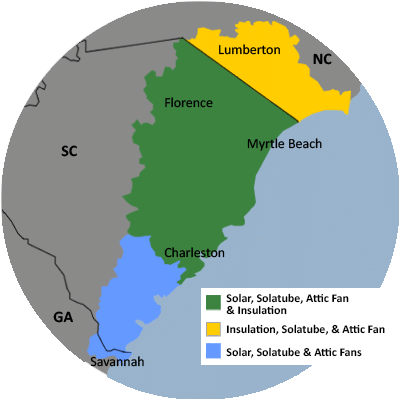 For a FREE no-obligation estimate in Charleston County, SC, please fill out the form to the right and Carolina Energy Conservation will contact you shortly. We specialize in a variety of services aimed to lessen your home's carbon footprint and save energy and money each month! We offer it all, from air sealing to ductwork to insulation and HVAC services in Charleston County, SC. For a FREE, no-obligation services estimate in Charleston County, SC, you'll also receive a free copy of "Saving Energy and Money at Home," a great book to use as you begin to create a more comfortable, healthy, and energy efficient home! New fiberglass batt insulation was installed to insulate the floors. This customer was so excited to lower their electric bill. Once they made the decision to go solar, they did their research and called several different companies requesting quotes and customer reviews. After much comparison, they chose Carolina Energy Conservation. Our solar team worked with their HOA to get approval to install 39 solar panels across the front and back of their roof. We worked to get them the best panels for their budget and they were thrilled to see savings. Now they are producing almost 83% of their electric usage all thanks to solar energy!